Create batiks using images from ancient Egypt and America. Class size limited to 12 students in order to provide maximum teacher-student time. Learn watercolor painting with Nancy Lewis . These classes will provide you with the basic skills of working with watercolor: how to mix the right amount of water and pigment, how to apply the medium in various ways like brush work, washes, splattering, pouring, and rich texturizing methods. Learn how to make corrections. Nancy Lewis, a regional artist has been an instructor at Colorado Mesa University, Colorado Institute of Art, Arapahoe Community College, and the Professional training Center presents. During these series of art classes where she will share her artistic insights on how to using color, visual elements of art, and design concepts through exploration and experimentation. Nancy has been teaching people new graphic skills for over 25 years. Contact Nancy to register (970)462-7370 or nancy@nblewis.com. Register here on our Workshops page. At the tenth Annual Art & Chocolate Walk in Palisade, free chocolate takes center stage with numerous businesses offering unique holiday gifts and fun for the whole family. Participating shops and studios include The Blue Pig Gallery, Wedel Pottery Studio, Casual Gal Silversmith, A Country Cupboard, Underwood-Turning, Slice O’ Life Bakery, Sandy King Studio, Craig Gallery, CAVE, Mark Young, Deb’s Funky Folk Art, Nancy Lewis, and Everything Collectible. The event is free and everyone is encouraged to complete a "punch card," by visiting all of the Art & Chocolate Walk locations. When the card is punched by all participating merchants, it is entered into a drawing for a large basket brimming with fine art and chocolate from every vendor. A map of all participants' locations will also be provided. A good place to start is The Blue Pig Gallery. According to Kay Crane, area artist and coordinator of the Art & Chocolate Walk, "Palisade is a wonderful arts destination for the Grand Valley, and the Art & Chocolate Walk is a fabulous way to start the holiday season and offers visitors unique art, jewelry, gifts and more at affordable prices. It’s also a great way to support Small Business Saturday!" All events are free and open to the public to help support small businesses and people in the Grand Valley. For more information, call 970-464-4819. Get a taste of the batik process while creating your own petroglyph inspired artwork. 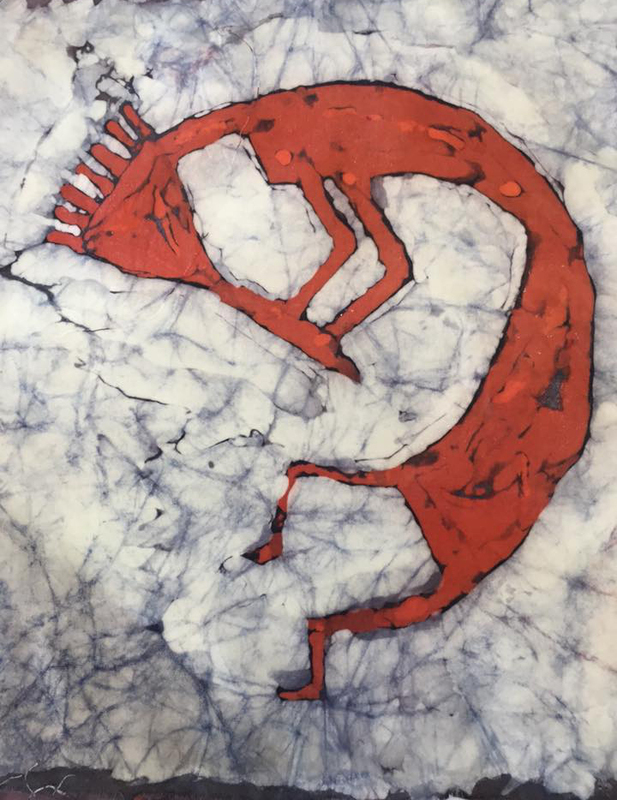 Kokopelli, and his many friends, are easy and fun images perfect for the splash and crackle of this ancient resist technique. Experiment with paint brushes, traditional tjantings and kaps (metal stamps). Students will create two images, using wax, dyes and cotton fabric. And at the end of the afternoon, the mystery of batik will be resolved and students will have two pieces to frame or use as wearable art. Susan Metzger is a Palisade artist with more than twenty-year’s experience working with batik. A member of the international Batik Guild, she has studied on her own and in Indonesia. Last year Susan taught four batik workshops after a 16 year hiatus. Susan’s August and September classes at the Blue Pig sold out. So this second event is being offered in Mesa, Colorado. Questions? Call Susan at (970) 208-7978. Susan Metzger is a Palisade artist with more than twenty-year’s experience working with batik. A member of the international Batik Guild, she has studied on her own and in Indonesia. Last year Susan taught four batik workshops after a 16 year hiatus. Susan’s August class at the Blue Pig sold out. So this second event is being offered in Mesa, Colorado. Questions? Call Susan at 970 208 7978 . Palisade Art Vision and The Blue Pig Gallery would like to invite the public to join us in Palisade on the evening of September 8 at 5 p.m at the Town Plaza at 3rd and Main streets. This event combines the 2018 unveiling of this year’s seven new sculptures, which will be on display for the next year, honors the 2017-18 artists as their sculptures are removed and announces PAV’s new acquisition – Flux by Amos Biocic. Our first installation in 2016 featured renowned regional sculptors, Dave Davis, Gary Hauschulz, Lyle Nichols and Steve Kentz. Our first sculpture was purchased in 2016, “Spring Herons” by Steve Kentz, with 75% of the proceeds being returned to the artist and remains in the PAV permanent collection. 2017-18 sculptures included Dimitri Domani Spiridon, Amos Biocic, Pavia Justinian, Greg Todd, Nathan Hale and Daphna Russell. PAV was formed in 2015 by a group of local citizens and artists to promote and embrace “Art as a part of everyday life.” Palisade supports the PAV vision of an outdoor sculpture program to promote a visible aesthetic voice of the town, The Peach and Wine Capital of Colorado. After the sculpture unveiling, everyone is invited to gather at the Blue Pig Gallery to celebrate its 11th birthday with peach cake from Slice o’ Life Bakery and ice cream from the soon to open Purple Cow, (which will be serving ice cream from Graff Dairy). Also happening that evening is the opening of the Black and White Show at Craig Gallery! Grand River Vineyards will be pouring wine throughout the evening at the Blue Pig. Susan Metzger is a Palisade artist with more than twenty years experience working with batik. A member of the international Batik Guild, she has studied on her own and in Indonesia. Last year Susan taught four batik workshops after a 16 year hiatus. Create a scene of the Chinese Venice, Suzhou while exploring the ancient art of batik. Fabric, waxes, dyes, tools and expertise will all be provided by instructor Susan Metzger. On day one you will begin the process of transferring your design to fabric, and day two you will complete the waxing and dyeing process, finishing with a ready-to-frame batik. Class size is small to allow plenty of personal attention. Time permitting, a second batik is possible. All levels welcome. Learn to draw and, or improve your skills. This is an art camp experience for grade school and middle school aged students. After learning to draw what you see, students will complete the week with acrylic painting. Starting with pencil and drawing using the right side of the brain, students will break out the acrylic paints by mid-week. Plan on hard work and a bucket-load of fun in this week-long workshop session with artist Mary Pat Ettinger. Pre-register and payment required. Register here on our Workshops page. Mary Pat Ettinger has been working with young aspiring artists for over 20 years and thoroughly enjoys helping them tap into their creative potential. Instructor She is an accomplished artist and an experienced teacher. She is the first artist at the Blue Pig to offer a workshop especially for children. If you have questions about the class, contact The Blue Pig Gallery at (970) 464-4819 or Mary Pat Ettinger at (970) 620-1291.
pours honey wine. Browse art featuring birds, bees and blooms, as well as batik and encaustic works using bees' wax in the process. Everyone is welcome! Dan Bean will be on hand on Friday evening from the Palisade Insectary to answer all your questions about bees and he will have some beneficial insects on hand as well, for show and tell! The kids will love it and so will you! On Saturday, from 11 - 4 pm, bring the kids to town for lots of exciting events, including a spelling bee, a bee costume contest, face painting and sidewalk chalk art they can create themselves. More than 70 wonderful vendors will line the streets offering all kinds of treasures. And you'll find delicious food offerings at local restaurants and food trucks. Learn pysanky, a resist process similar to batik, and learn to create surprisingly intricate designs on an egg shell surface. Students will use kistka – traditional tools for holding hot wax – to draw designs on the surface of eggs, and then dye them. Students can create their own designs or use templates from traditional pysanky. Students will leave the class with a large decorated egg. Experience the thrill of creating your own egg ornament. Using traditional Ukrainian tools put a "new age" twist on your design. Let your imagination be your guide. Come explore techniques and possibilities with cold wax & oil. Susan will provide demonstrations each day. All levels of artists are welcome (advanced & budding artists)! You'll enjoy learning various techniques, including embedding papers, creating textures, and more! Susan will show you fun possibilities to explore and enliven your work. Students will come away with knowledge, inspiration, and 1-2 finished pieces. (Feel free to bring unfinished pieces of art as "cold wax" medium could be just what you need to make it work). This four-hour workshop will introduce, explore, and give understanding to the characteristics of color in artistic compositions. The mysteries of mixing color, choosing combinations, and the use of aesthetic color relationships will be achieved by hands on creation of a color wheel an d experimentation in color intensity, saturation, and neutralization to achieve the color interaction, shades, and tints you desire in your artistic creations. Hands-on learning and developing a color vocabulary is emphasized. All still levels welcome! About the instructor: Donna Page is a long time resident of Colorado and currently lives in Mesa, Colorado where she designs commissioned stained-glass creations. Fine art has always been an educational passion with practical application in a variety of media. The use of bold colors, texture and line in two-dimensional design has been the focus of this artist’s work for over 30 years. Several years ago exploration in stained glass freed the artist to experiment not only in color, line and textural design but to utilize and implement the unique, ever-changing effects and qualities of natural light on colored glass. If you ever thought of trying your hand at watercolor painting this class for you. Join Nancy Lewis and explore the world with watercolor. Bring your own photos or use Nancy’s photos. This series of classes will focus on bringing the world alive with watercolor painting. The classes have been designed for all artistic levels and Nancy will assist each student, bringing their art to a new level. The first part of each class will introduce a new watercolor skills. The rest of the class you will work on a project of your own liking. The class will have plenty of trial and error time, group discussions and individual attention. To help each person achieve their goals, Nancy will work with each student one-on-one providing valuable guidance. Now is the time to light your artistic passion on fire! Nancy Lewis, a regional artist, has been an instructor at Colorado Mesa University, Colorado Institute of Art, Arapahoe Community College, and the Professional Training Center. Nancy has been teaching students new graphic skills for over 25 years. Private or individual or children’s classes are also available on request. If you have questions about the class, contact Nancy Lewis at (970) 462-7370.